So, thanks to my friend Chuck Baudelaire, whose witty musings can be found here, I learned that there's this thing going on this month where bloggers are devoting a blog a day to each letter of the alphabet. 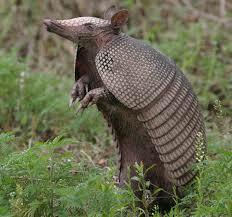 A: Armadillos – they’re my favorite animal. Shrinks eyes light up in dollar signs when you tell them that. Just saying. B: Bees. I’m kind of loving bees right now. Last year I was dressing up like a bee for the company-wide meeting. This year I’m looking at a piece of bee themed jewelry to add to my collection. C: C. The grade I received in four classes in College – Economics, Statistics, Weather and Climate and… Creative Writing. Yeah. I was young, dumb and in looooooove. E: Eating. I don’t have an eating disorder. Sometimes my eating is a little disordered, but it’s not quite the same thing. F: French. I minored in French in college. It’s been ever so useful. Not really, but I sound good speaking it. G: Guilt. Along with Anger and Amusement this rounds out the trifecta of my most common emotions. H: Hallucinations. Olfactory Hallucinations. I swear someone opened up a gallon of Mr. Bubble and poured it out on the carpet near my desk. I: Ice. It’s good for hockey. It’s great in beverages. I love ice. J: Job. Love your job and you’ll never work a day in your life. Thankfully, I love my job. Some days, it’s still work, though. K: Kale chips. These are suddenly popular. You can have ‘em. Blech! L: Lola. I still miss her. Duh. M: Mary Worth. I read it every day. I started in college, stopped for a while then picked her back up when I moved to Nashville. M is also for Meddling Biddy. N: New Orleans. I wish I could go again this year, but it’s expensive. Instead I’m going to Newark. For work. O: Opossums. Scarier than snakes. Way, way scarier. P: Possums. I hate them so much, I’m listing them twice. Q: Quirky. Yes, yes I am. R: Ringo Starr. My favorite Beatle. Not the best or most talented Beatle. But I love me some Octopuses Garden. And he amuses me. S: Showtunes. I’m addicted to them. Book of Mormon is in heavy rotation these day. I also like The Last 5 Years. And South Pacific and Avenue Q.
T: Tea. Unsweet. Ok, I prefer it sweet, but I refuse to drink the calories. U: Underwear. I need more. Last summer, I was traveling so much I couldn’t keep up the supply/demand J curve. I bought some really cheap stuff and it’s starting to disintegrate. V: Vinegar. So the French word is vinaigre, which literally means “soured wine”. And what is vinegar but soured wine? I love it when I teach myself new things. W: Words. I use the words awesome and amazing too often. I’ve made a conscious effort to correct. X: X-Rays. Aside from dental x-rays, and the stuff at the airport, I’ve gotten to nearly 40 years without needing an x-ray. Go, me! Y: Yvor. This is the name I settled on for my new car. The YYY license plate dictated a name starting in Y. And I think my car is definitely male, so. Z: Zumba. Because I freaking love it. I love it so much, it hardly feels like torture. You know what? I'm going to do your list now! Maybe we could start a counter-trend of an alphabet a day!